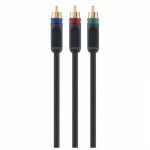 Component Video Cables provide more colour detail than S-Video and are an ideal solution for HDTV, Digital Satellite, and progressive scan DVD players. 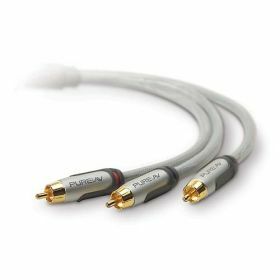 PureAV Silver Series Component Video Cables deliver a more vivid and vibrant picture and true 75-Ohm impedance for the ultimate home theatre experience. The use of sophisticated technology and superior-quality materials enable brighter, more saturated colours and sharper images. 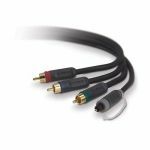 -Distributes a consistent, accurate picture by providing maximum bandwidth through true 75-Ohm impedance. 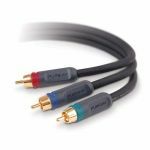 -Drastically reduces signal distortion for unrivaled image clarity using 99.9997% oxygen-free, PCOCC conductors and high-purity, silver solder joints. 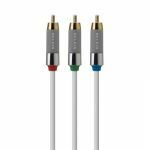 -Delivers best high-frequency response for optimal resolution using silver-plated conductors. -Isolates from outside noise for superior clarity with quad-shielding. -Maintains stronger signals that yield superior colour accuracy and clarity with precision-formulated, nitrogen-injected dielectric material. -Protects against wire damage for consistently high-quality audio with integrated strain relief. -Maintains integrity, even when bent with abrasion-resistant, flexible PVC jacket. -Creates precise contact for low loss with split-tip, centre-pin, and 8-cut, 24k gold-plated connectors. -Provides comfort and ease of install with non-slip rubber grip and integrated colour-coding.